Trials of a revolutionary, natural and cheap alternative to traditional hygiene practices is likely to spawn a completely new approach to the war against hospital superbugs. The startling results show that harmful bacteria can be completely eliminated by using ‘friendly’ bacteria in a simple cleaning fluid - rather than toxic chemicals. The trials, carried out by UK-based hygiene specialists Chemex International, were unveiled today at a conference of over 600 members of the Infection Protection Society in Bournemouth. “Since the days of Lister and Florence Nightingale science has put a lot of effort into killing bacteria. This approach certainly has its place but we have now proved that nature’s methods can be more effective. But it does turn traditional wisdom on its head somewhat. 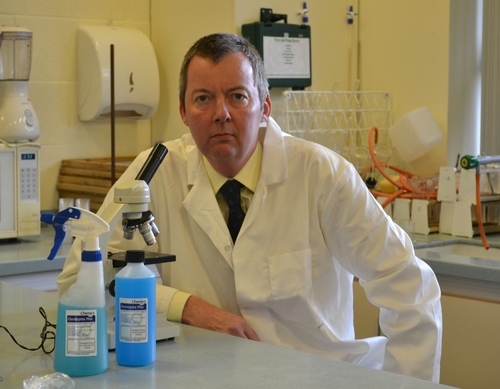 Our research has proven that employing ‘friendly’ bacteria in a cleaning product rather than harsh chemicals drove out the bacteria that can be harmful to humans present at the start of the trial. The ‘bad’ bugs were completely eradicated – and the good ones did a very good job of eating dirt and grime as well. It’s fighting fire with fire. The friendly bacteria chase out germs and form a protective biofilm that is tougher than Teflon and keeps the bad bacteria away permanently. The same principle is used in probiotic drinks that repopulate the gut with ‘good’ bacteria. It’s called competitive exclusion. In reality we are surrounded by bacteria, most of which are totally harmless or positively beneficial - without them we wouldn’t have bread, cheese or even wine and beer – all of which are made by bacteria. Problem bacteria can be concealed in minor cracks and blemishes in buildings and are very difficult to completely remove without costly shutdowns and deep cleans. And they soon return. This is a completely new approach to dealing with the pathogens that cause hospital-acquired infections. It is also simple, cheap and highly effective. We have trialled this approach with a very forward-thinking NHS Trust and we saw more than just a visible improvement in cleanliness; scientific tests clearly demonstrated that harmful bacteria had been totally eliminated.The ‘friendly’ bacteria are abundant in nature, the strain we use feeds on dirt and produces natural antibiotics which attack and kill the harmful bacteria. It really is using nature’s technology to clean wards and get rid of pathogens once and for all". Chemex International has previously helped NHS Trusts and private healthcare across the UK in the battle against killer bugs. Its high-level biocides are powerful enough to kill ‘difficult’ organisms such as Clostridium difficile spores and Norovirus against which traditional chemicals are ineffective and are in use in multiple NHS Trusts and other situations where scrupulous hygiene is paramount. For more information about Chemex International, go to www.chemexuk.com or call 00 44 121 565 6300. Copies of the full research paper are available on request. Chemex International is Europe’s leading franchised distributor of specialist cleaning and hygiene products. Established more than 25 years ago it has more than 70 branches across the UK, Europe, Scandinavia, Canada and North America. It supplies hygiene and infection control products and programmes to clients including ambulance trusts, government departments, blue-chip corporations and Michelin-starred restaurants. Its head office is in Birmingham, England. This press release was distributed by ResponseSource Press Release Wire on behalf of Interactive Wardlovett in the following categories: Health, Business & Finance, Medical & Pharmaceutical, Public Sector, Third Sector & Legal, for more information visit https://pressreleasewire.responsesource.com/about.